One of the things that's so great about living on the central coast of California is our close proximity to many strawberry fields, which translates into many strawberry stands:) What a taste treat it is to eat sweet, red strawberries, picked fresh from a field only a few yards away! 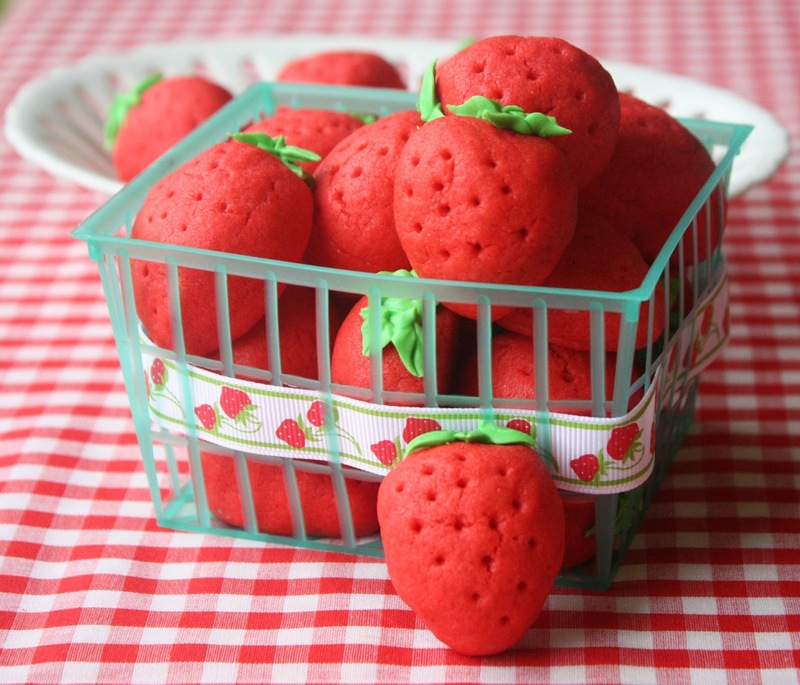 This basket of strawberries is also packed with sweet, red berries...cookie-fied! 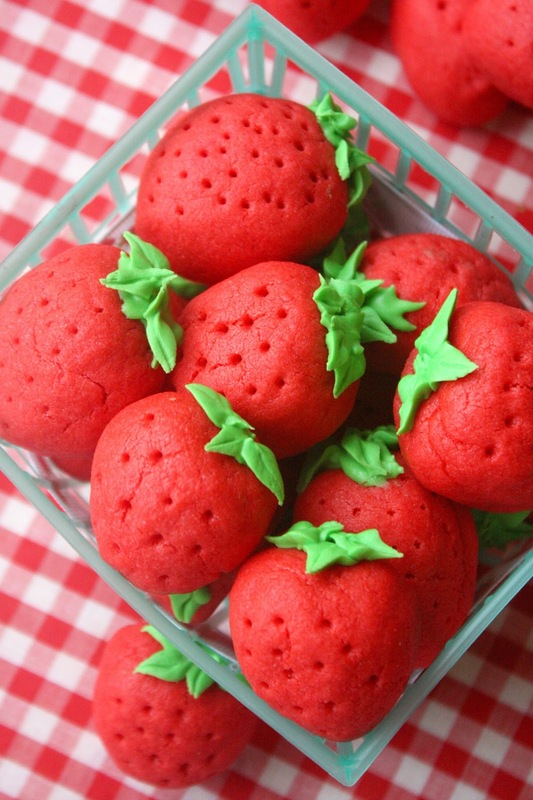 These strawberry cookies are not difficult to make and a few baskets can be filled up with these cuties in no time at all. No cookie cutter is used, and only a little bit of royal icing is needed for the stems. 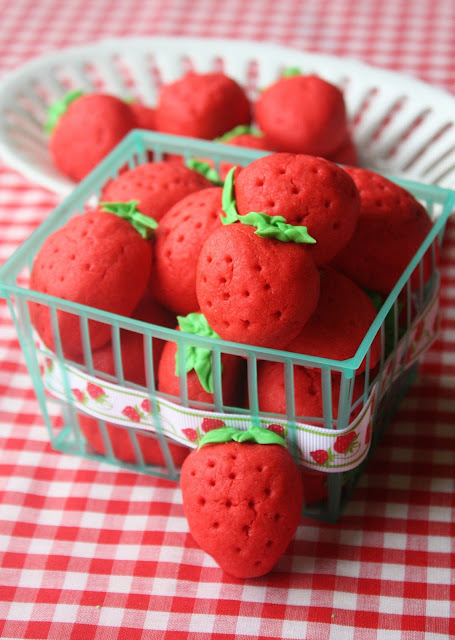 I did make some iced strawberry sugar cookies last April, that's why I called these "Take 2". Spring around here is the onset of strawberry season and I have already made some jam, a strawberry trifle, and now these cookies, which actually only look like strawberries, but have no berries in them. Next up will be fresh strawberry cupcakes topped with fresh strawberry frosting:) Doesn't that sound yummy? It was a lot of fun to make these cookies, and I was happy with how they turned out! They aren't juicy, but they are soft and sweet! Mix up a batch of your favorite sugar cookie dough. Add some red food coloring (I used AmeriColor Super Red) and mix thoroughly. Take a small amount (walnut size) and shape into a strawberry shape. Place on lined (Silpat or parchment) cookie sheet. With a toothpick, poke holes into the cookies to represent the seeds. Place cookie sheet in the freezer for about 15 minutes before baking, to help cookies hold their shape. Bake at 350 degrees for about 15 minutes, until set. Make some royal icing and add green food coloring to it. With a leaf tip, add a few leaves to the top of each cookie. Oh my goodness...So cute!! Love these! SO adorable!!!! I love these Sue! Super cute! 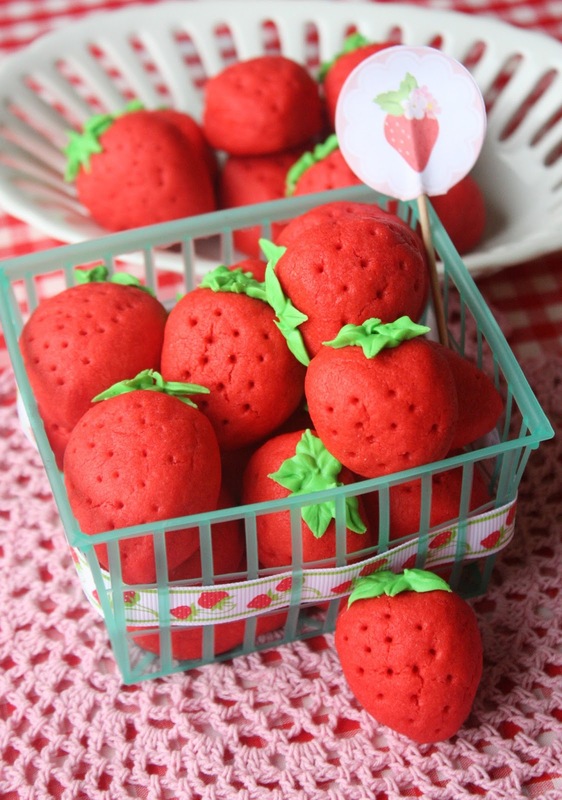 You can easily flavor these to be strawberry :). These are beautiful!! They looks like marzipan strawberries!!! Strawberry season is the best and these 3d cookies are a great celebration of this time of year! I love how totally adorable these are and yet so simple! The cookies look adorable but I beg you to start sending some strawberries up a little further North! Nothing sweet enough has made its way to the SF bay yet! I need some Watsonville strawberries I'm my life soon! But I can settle with these cookies for now haha. Love them! This is a brilliant idea! So easy and so beautiful, now where can I get a strawberry basket?! Thank you. Your cookies are adorable, and I love the way you've displayed them. What a perfect introduction to spring! No stinkin' way Sue! These are adorable!!!!! Ok, I must have missed something?! How do you get them to not flatten out when they cook? Oops, you're right:) I edited the post and included the important step of putting the cookies in the freezer before baking to help them hold their shape; it worked! So cute Sue. These would make a great little VT gift. These are so cute! I can't wait to give them a try, Sue! I love these and the fact that they are made with sugar cookie dough. Great presentation Sue! How cute are these - and that little basket??? Super Cute!!! These are just toooo cute. I must give this idea a try. We're having a party at Tumbleweed Contessa - Saturday Dishes - featuring strawberries. These would be the star. Hope you can bring these over. It goes live tomorrow morning at 800AMMDT. Oh...these are so pretty. Makes me crave for strawberries...and cookies! hahaha...is that even possible? But you did it. these are so cute. Oh wow, your cookies look amazing! This is is the sweetest treat ever. I give treats every month to gal friends at church and this would be perfect for my April treat. Thanks so much for the great idea. Your cookies have wonderful shape, color, and realism. I love how you packaged them too! These are absolutely adorable! I would love it if you would come share this & any other recipes you may have over at my Sweet & Savory Saturday's Link Party. It ends Monday at midnight. These are way adorable!! Thanks for sharing :) Pinned! These are so adorable! I just don't know whether to Pin them to food or crafts! Adorable! I'm a bit jealous of your access to those gorgeous CA strawberries. Nothing like farm fresh. I would love for you to link up at SHOW-licious Craft Showcase. These are adorable, I have to admit I haven't heard of sugar cookies before, I in the UK and cookies are only just becoming popular (we tend to have eat and make biscuits). Really looking forward to giving these a try, perfect for parties! Wish that I can be cookie-fied too! These strawberry cookies look real and adorable. Sue, these cookies are easily some of the cutest I've seen! My strawberry-loving mama would go bonkers for these on Mother's Day. Your recipes never fail to make me smile!! Oh heavens! Those are super cute! This is SO CUTE! I feel like running downstairs to make this right now! Thanks for sharing! These are so stinkin adorable! These are soooo Pin Worthy! :) Newest facebook follower! Would love to have you share at my link party! These would look really adorable used as cupcake toppers, too! I seriously love these! Thanks for sharing at Sweet & Savory Saturdays! Very interesting to keep the cookies in the freezer before baking to keep their shape! They look awesome! I LOVE these!! They are super cute and so fun! Thanks for linking up to Two Cup Tuesday at Pint Sized Baker. I've pinned this for later. These are very cute looking and putting them in the strawberry carton just seals the deal. Thanks for the idea! I made these for my children's school's bake sale...my shaping like strawberry skill is lacking,but I had hopes that the "leaves" would at least give a hint as to what they were.My first attempt at royal icing left the icing a tad too runny, but it was workable and did the job. I thought they looked acceptable once I had topped them with the leaves. I asked my almost 4yr old, "What do these look like?" he said, "uh. ummmm....cookies?" The last stitch effort is to package them in a strawberry container from real strawberries! Thank you for your talent and inspiration!!! Thanks for sharing:) I hope you had success at the bake sale! these are too cute! I'd probably dip them in vanilla candiquik for a little extra sugar, lol. mmmm Okay how have we not connected before? For reals? I was browsing through and realized I already shared the link for this on my Facebook page. Love your work new friend! I wanted to send a separate email, but couldn't find a way to do so. ANYWAY....since I don't have a blog, and I was inspired by your strawberries, I wanted to share with you an idea for CHRISTMAS: make sugar cookie Christmas lights! Would love to see you make them! chocolate covered strawberries. Love it!